Another report for the sardine from this morning…this place is just EPIC!! Richard and Billy Brake have been fishing with us every single year since 2001. 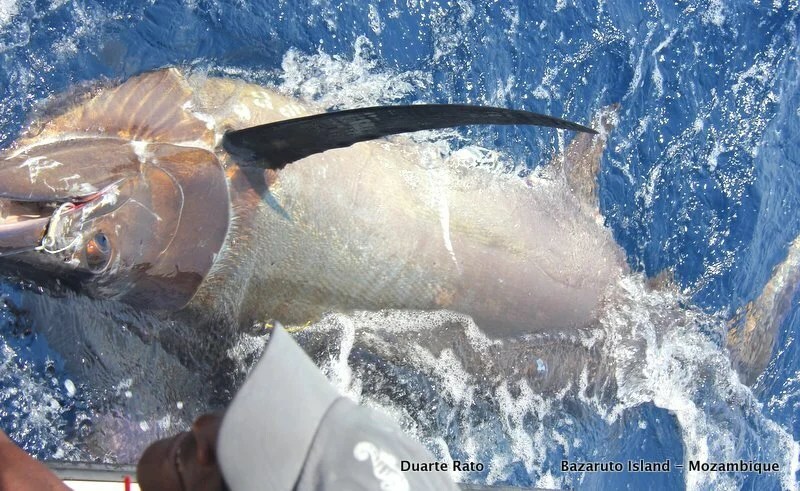 In that time they have caught numerous Marlin up to 850 pounds. Billy caught his first Marlin with us when he was about 12 and four years back he fought a fish for 3 hours that was sharked on the leader that we estimated at 6oo plus pounds. Well, they have just arrived on the first of their two trips to fish with us at Bazaruto this season and after an initial slow first day, we got a great fish for 17 year old Billy today. We started the day game fishing and caught a few cuda and Yellowfin tuna. At 8h30 we put a live bait out which was sharked within a few minutes. After catching another 2 yellowfin we live baited another and after a 2-hour wait Billy hooked up to a nice Black Marlin that we eventually released and estimated at 500 pounds. All in a half days fishing off the Bazaruto Archipelago!!! ← Karl Gouws headlines again!